Cruise Etiquette makes going on a cruise a fantastic travel opportunity. You get the pleasure of seeing other places, great entertainment opportunities, and the chance to meet a lot of interesting people. At the same time, there is a lot of room for offending others if not done correctly. Do not slam your cabin door when coming or going - On most cruise ships, the cabins are generally in close proximity. It is bad cruise manners to slam the door when others might be sleeping. Close the door gently. Be a good audience - Most of the entertainment on the ship will be of a high caliber. However, if the entertainment is not something that you like, it is always best to do as my mom always told me...don't say anything at all. Dress appropriately - No one wants to see you in your bedroom attire or walking around like you would in your own home. When you are in public, be fully dressed and aware of others. Your clothing and dress truly reflect who you are. Some cruises cater to the family oriented atmosphere and you do not want to offend parents by dressing like a Vegas showgirl. 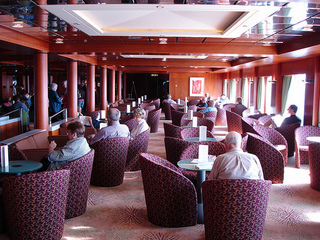 Drink in moderation - It is bad cruise etiquette to become the "drunk" of the ship. Make sure you have fun while you are on the cruise, but know your limits. Becoming drunk can not only be embarrassing, it can be painful too. Be polite at your table - Your table manners and etiquette will certainly apply at mealtime. Be thoughtful of the other travelers at the table. A good cruise tip is to allow the others to be served first. They will appreciate the gesture and it is an easy way to be friendly to the rest of the table. Tip the staff well - Many of the workers on the cruise are paid on tips. Proper tipping etiquette rules apply here. If you were a worker, what would you want people to do for you? These cruise etiquette tips will make sure that you not only have a great time on the cruise, but it will ensure that you do not offend others. Bon voyage!